(This Diwali) Google Pay App (Tez) – Get Rs 51 on Sign up + Rs 201 per Referral, Tez App Refer and Earn Offer. With Tez Google Pay App you can Send money to friends, instantly receive payments directly to your bank account & pay the nearby cafe with Google Pay, Google’s new digital payment app for India. 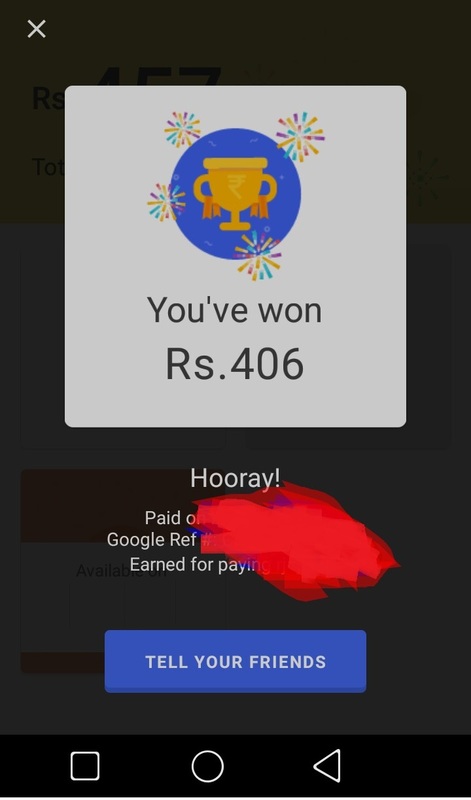 Well Google Pay Tez App has come up with Refer and Earn offer where you will get Rs 51 on Joining and Rs 201 per Referral. So Hurry up !! Note:- Now Earn Rs 201 per Referral, Check your invite page to know Exact referral amount (Depending from user to user). 2) Install & Open the Tez App by Google. 4) Add your Bank account and Create UPI. 5) Pay Rs 1 and You will get the Rs 51 on Sign up instantly (It might take sometime). 7. Note:- First payment transfer should be done before 13th November 2018. 1) To Get your Referral code Click on “New” Scroll down to the bottom >> Invite Friends to Tez >> Share it using any mode and get your Referral link. 2) Share it with your Friends and once He/she will make his first transaction, Both of You will get Rs 51 (Joining) and Rs 201 (Referrer) in your Bank account directly. 3) Your refer code is your last 6 digits of referral link. 1) You may invite anyone to join Tez and if your invitee registers on Tez through your unique Tez invitation link (see offer details for your unique link), and successfully completes a payment using the Tez app, you are eligible for the Tez Referrals Offer. 2) You (Rs 201) and the invitee will receive Indian Rupees Fiifty One (INR 51) each, in yours and the Invitee’s designated bank account. As such, you and your invitee must have a UPI-enabled bank account attached to your respective Tez accounts to receive payment from Google. 3) You can only take advantage of this offer once per registered invitee. 4) Invitee can only take advantage of this offer for his first Tez transaction. 5) You can earn a maximum of 50 referral rewards. 6) You can earn referral rewards up to a total value of Indian Rupees Nine Thousand (INR 9,000) per financial year (1 April to 31 March), across all Tez offers. Transfer directly to your bank account. 1) Simply link your account to Tez over UPI and instantly transfer money from bank to bank. 2) Know your money is secure. With Google’s multi layered security and 24/7 protection by Tez Shield, you can make payments and transfer amounts both big and small, with confidence. 3) With Tez’s Cash Mode, you can instantly send or receive payments to anyone nearby without sharing personal details like your phone number or bank account. Bhai ye offer subah se subah se hi try kar raha hun but ho nahi raha hai because of rooted device. App is not working on rooted device. Recently launched, They will work for Sure for Speed. Don’t Forget Google has “Play Store” & Youtube who is handling alot of downloadings, streaming per seconds. Best Part in this App is “Chat support” which is fast and helpful. I want to exchange tex 51 so we both get scratch coupon can u do this? Slowest app i ever seen. You wil get in bank account directly. Please wait for some hours. I Don’t have bank registered mobile number. Am i eligible for this offer?? Send you 1 rupees but didn’t get anything…. You will get soon.. Please be patience. Hey bye-mistakely I didnt downloaded the app from your link. Now if I de-register from the app and again download from your link and then register and do a transaction then will i get Rs.51?? Or is there any other solution for it?? Not Sure bro.. you can give a try! I used your link, but did not get any reward ticket. Wait few hours, You will get surely. NFC payment ( samsung pay jesa ) option lana chahiye tha google valo ko , ye sare option to phonepe pe bhi mil jate he ! Google just Launched this.. More Features is coming soon. Google has Power to Take Over on Paytm as well. But looks like Google want to be simple app just like “PhonePe”. Hide my root and rootclock not working. Its Google app so no tricks are working. have u enabled root cloack in xposed module? Bro not detecting my SBI Bank account… Wat to do ?? Any idea?? Try after Sometime, it will work for Sure! 51rs kitne days me receive honge ? is it mandatory to link UPI id to the app to avail cashback ? can’t we skip adding UPI/bank account and use only Tej wallet just like any other wallet application like paytm mobikwik? Not Possible.. its a UPI App..
Debit/Credit feature is coming soon. Note:- I face same problem, but later it works! Wats it upi I’d yazhweer? You are Eligible, You will get the amount soon. It will come in next few hours. What is your mobile number to pay 1 rs? Id is not working! Working for transfer as well. Try again, It will work for sure. I tried to send to ur upi I’d but it is saying invalid upi I’d … Wat to do?? hey yashveer ,i want to know which earphone is better in sound quality specially bass in 1000rs. 1more piston fit/sennheiser cx180 street II or any other? No Experiance bro.. But i suggest you to check Ratings & reviews of every brand’s earphone. Suggestion:- Go with sennheiser cx180 street. Boat is the best I’m using it. Is this for JandK bank also. if i download from ur link, can u give me 25 back? UPI Required bro..But Mobile Number change via ATM can help you. Do Sign up again.. Try it, If you will not get any success, Then Delete old vpa and create new one. You will get Rs 51 directly in your Bank account. Where to spend those money? Ofcourse its Powered by Google. Please aprov tis…as there is a limit of Rs 9000.
ya jetno ko refer karo utni bar milta he?? For each referral you will get Rs 51. You can earn maximum upto 9000 per account. Is there any limit in number of referrals? 50 referral as per T&C.. but we are getting upto 9000 per account. I I HAVE DONE RS 10 UPI TRANSACTIONS FOR 18 SEP 2.00 PM. Goto Help & Support >> Online Chat. You have added UPI Bank ?? If yes then please wait for atleast 24 hours. You can Chat with customer care as well. it will be credited to you soon.. please sent rs 1 to us only not others… Also chat with tez team. Chat to Tez App Team. Goto >> Help & Support >> Online Chat. Ask them about this. Note:- Amount is crediting in just 1 hour and sometime taking upto 24 hours. Friend please download from my link I will resend your Rs1 . Send me ₹1 or ₹50 I will return your money surely.both are earn scratch card and cash reward. bhai mera ek hi number do bank par registered hai. agar main dono bank add karun to kya mujha do bar rs 51 51 milega? Make your first payment and we both get ₹51! Enjoy the cashbacks…. Both will get ₹51 into bank acc…???? App is also Crashes for me (Unrooted Redmi note 3). how to use rewards balance? money will directly come to your bank account. Admin, I have downloaded tej app from your link but I have sent money from tej app to another UPI aap then please tell me I will get cashback or not? send rs 1 to our upi as well..
Expect payment within 48 hours showing….why? How to chat tez app…. chat option is removed.. only call option available..
mention your downloading time and which upi id was available on that time is our post.. so i can give you correct details..
Yashveer, Mene aapki link se download kiya lekin successful nahi hua aur normal tarike se install-register hogaya hain toh ab koi dusra tarika hain aapka referral code enter karne ka ? Abhi transaction nahi kiya hain.. Agar koi dusra refer code ka tarika ho toh batav uske baad mein 1 rs ka transaction karu. I am refer 1 Frd & my Frd made 1st UPI transaction….. He got 51 but my 51 rupis showing processing……. 5 hour gone. It will come in 72 working hours. I am getting error – “Your bank account is not valid”. What should i do now ? I can’t link my bank account.I have tried for about 20 times but can’t link my bank account.So please help me. Hey guys, See this..https://i.imgur.com/vdM5ses.jpg –I won 406 Rs in a Scratch card. You can also win if you are a new user.. Just download from my link–https://g.co/tez/0d68L and send me 55 Rs. We both will get 51 Rs and a scratch card to win. Note: Dont worry I will return your 55Rs back. My App is not Opening from Day 1. So can’t do this Task. Bhai this time successfully installed the tez app after rooting with magisk. I installed the app by your link but referrer harsh sharma dikha raha hai.. aur bhai ye batao pesave app abhi bhi kaam kar raha hai kya means tumhare link se 50 signup bonus milega kya? Coupon s are also amazing. Get ₹650 reward scratch ing the coupon.amazing? No one are going to arrest You! The coupons are really awesome !! I got more than 3k till this week….but after launching tez ,google makes upi interface very slow…. If i clear data of app and use my own refer code on other no. Will i get 51 Rs in both or not. Yes, You will get. But how you manage a new bank account for UPI? I have another bank account with other no. Can same happen in phonpe. Check out Tez, a simple and secure payments app by Google. Make your first payment and we both get ₹51! Yeah bolo na ki apko paisa cahiye is I liye apne repost kiya. 1st Time we have Posted this offer as (Loot) in heading. So This is coming from starting. By the way, How Loot word helps me to give money? And About Repost “Yes we did So maximum people can avail the benefits). Also I want to Say you, We also do alot of Extension of Simple posts as well (without Refer and Earn). If you were referred to tez, and not received referral credit of rupees 51 on making first transaction, you can update your tez app , open tez app, on home screen, click on 3 dot located on top right corner, click on referral code, enter “oC86h” click on apply code. Now send rupees 1 to 959944xxxxx or removed. I don’t get money from scratch cards from Aug to till now what happened? https://g.co/tez/1s79U Install app and transfer 500. You’ll get 10 scratch cards and guaranteed Rs. 51 in 8 random cards. The scratch amount can be upto Rs 1 Lakh . Try it and you’ll not regret. Before reading this article I don’t know about this Tez app(free money earning tricks) but after reading this article I tried this trick practically and I got free cash to my account. I hope you will post this types of best tricks info in next articles also. Thank you for sharing this article with us. And send just Rs-1 anyone.you get ₹51! grantee. First payment by 1st september Means you till 1st September. Yes, You ask your friend to do Payment now !! Nothing like that (1 Refer per day). Why not contact with Google Pay Team? For your missing referral rewards.